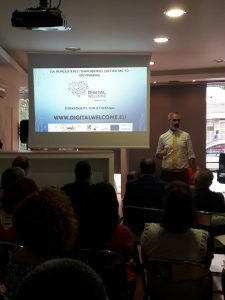 The multiplier event was held in Athens on 19 July 2018 by IASIS NGO in the headquarters of Fabric Republic, which is an independent management system for clothing. Fabric Republic aims to modernize the circular management of clothes donation: the collection, sorting, care, processing, donating to vulnerable social groups, recycling. For more information visit website: http://www.fabricrepublic.gr/. The aim of the event was to inform participants about the project, in order to recruit more participants for pilotings, since the second phase is about to begin. 24 psychologists, teachers and social workers, coming from different organisations (i.e Action Aid Greece, Metadrasi NGO, Caritas NGO etc. ), dealing with migrant issues. The multiplier started with a warm welcome and a presentation of the Digital Welcome project and all developed work packages. The event continued with a focus on the educational program for face-to-face training. Video editing (examples) and digital stories carried out during pilotings were presented as well. At the end of the presentation, the audience was invited to open a discussion on the presented work packages. The discussion has been very active. The participants showed particular interest for the digital tools. After the detailed presentation of the project, participants had the opportunity to implement informal learning activities based on the project methodology, such as energizers, self-presentation and soft skills-oriented. They participated also in some teamwork and self-presentation related activities. The multiplier event was successful. The participants’ feedback were really noteworthy. They were impressed about the results of the project so far and they are keen on knowing project’s methodology. Some ask to have deeper information about the educational program for face-to-face training. Everybody found the environment pleasant and the technical conditions appropriate. The overall feedback is that the WELCOME methodology is an innovative product. They were interests especially about the digital technology and the innovative IT workshops. Also, they liked the videos produced during the first phase of the piloting. Finally, they believe that it is a very useful tool for young people, because, using this, they will develop their skills and abilities for a better social integration.